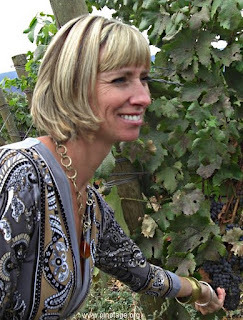 “Our Pinotage was a decision of the heart," says Jennifer Molgat, (left) owner of The View winery in British Columbia, Canada, in an interview with Brandi Parnell in Mint Magazine. The View was the first winery in Canada to make a Pinotage rosé and this year they released a blanc de noir White Pinotage 2015. It's the 11th win for both Kanonkop and Rijks! The awards function was held last night,26 August at the Cavalli Estate outside Stellenbosch. 144 wines entered this years competition, the 20th. for the event, which was the 20th time South Africa’s leading cultivar-focussed wine competition was held. Beyers Truter, chairman of the Pinotage Association, said that two features stood out from this year’s competition: the milestones reached by Kanonkop and Rijk’s and the performance of wines made from the 2014 vintage which produced four winners. “The vintage was late and cool, with a very wet pre-season and produced a relatively light crop,” said Beyers. “However, the wines from that year are now showing the quality and refined elegance to take Top 10 trophies, showing us how exceptional the vintage actually was. Consumers can definitely tick off 2014 as a must-have year for red wine." This year’s judges were Neil Ellis (convenor), Johann Fourie (winemaker for KWV), Stephan Joubert (DGB viticulturist), Francois Rautenbach (Singita wine and beverage director) and Samarie Smith (wine writer). Two winemaking students joined the panel as protégés. Kayleigh Hattingh and Tim Whitfield from Stellenbosch University and the Elsenburg Agricultural College respectively participated in the full tasting, but their scores were not counted. Neil Ellis said that the panel was not restricted to awarding a certain style of Pinotage. “My brief to the judges was to be objective in acknowledging diversity in styles found within the range of Pinotages entered and they really took this to heart. This year we saw many more examples where winemakers are not simply trying to follow the tried-and-tested methods used by icon wines from one or two specific regions. 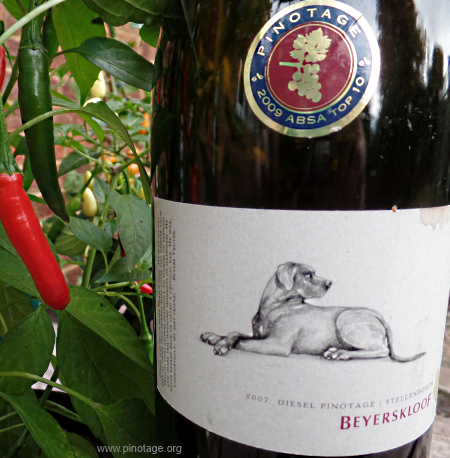 More Pinotages are made in styles that best suits the unique characteristics the winemakers are getting from grapes in their own areas. The 10 winners will be announced on 29 August 2016. This is the 20th year of the competition which started in 2007. In the past 19 years two wineries have won more times than any other: Kanonkop and Rijks, both taking 10 trophys, and it is good to see they are both finalists this year. There's a good mix of established names and newcomers. I'm pleased to see L'Avenir back in the finals; their vineyards produced 7 wins in the past and the current entry's back label honours Francois Naude the winemaker from that time. "Rijk’s and Kanonkop, as other finalists such as Simonsig and Diemersdal are no strangers to the Absa Top 10, while relative newcomer producers of the likes of Rickety Bridge and Frater Family Wines are exciting developments. "South African wine defies outdated stereotype", says Michele Parente at The San Diego Union-Tribune, who chose Kanonkop Pinotage 2013 as her Wine of the Week. This misunderstood wine, a hybrid of pinot noir and cinsault, tastes like neither. But it tastes delicious. So much so, I’m breaking the $30 limit on Wine of the Week picks to shout from the rooftops that if you haven’t heard of pinotage before, seek it out. 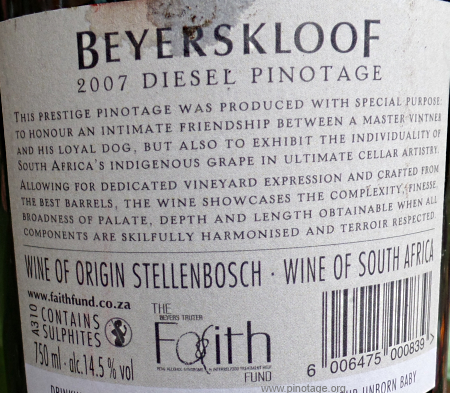 Or, if you’ve been unaware of the improvement in quality of these South African native wines over the past 15 years, consider yourself aware. 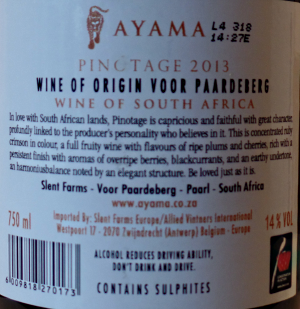 My Wine of the Month for July 2016 is Ayama Pinotage 2013, from their vineyards in Voor Paaardederg. Berries – especially red cherries – were very much to the fore on opening, with a light sweet cherry thread to the front on the palate. It treads lightly on its 14.5% abv with a bright clean fresh fruit finish. I’ve not come across this label before. 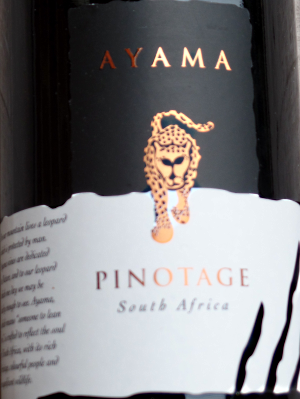 Ayama's first bottling was in 2006 and this wine was a Winner in the 2015 ABSA Top 10 Pinotage Competition.